Narendra Modi confers Shanti Swarup Bhatnagar Prizes for Science and Technology. 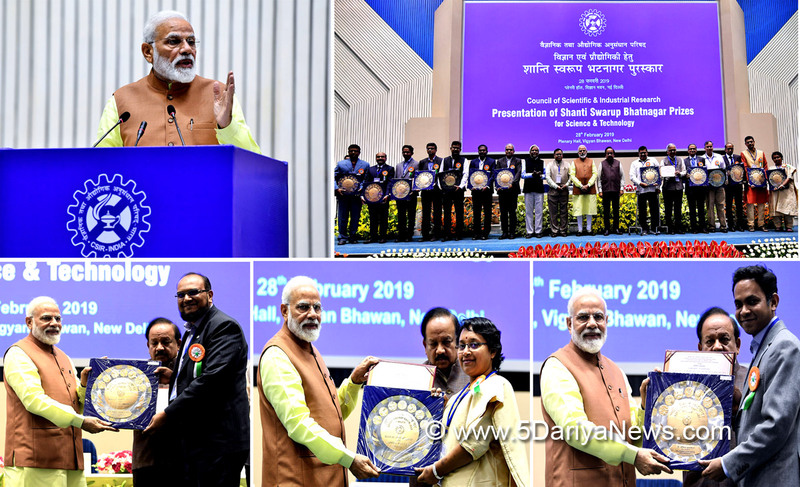 Prime Minister Narendra Modi today conferred Shanti Swarup Bhatnagar (SSB) prizes for the years 2016, 2017 and 2018 in New Delhi today. The SSB prize is awarded each year on the basis of conspicuously important and outstanding contributions to human knowledge and progress, made through work done primarily in India during the five years, preceding the year of the prize. The SSB prize, comprising a citation, a cash award of Five Lakh rupees and a plaque is given to each person selected for the award in the following disciplines viz. Biological sciences, Chemical Sciences, Medical Sciences, Physical Sciences, Mathematical Sciences, Engineering Sciences and Earth, Atmosphere, Ocean and Planetary Science.Congratulating the award winners, the Prime Minister said that science, technology and innovation should be connected with the aspirations and requirements of the society. He said that our scientific institutions should align with future requirements and try to find solutions for local problems. Prime Minister asked the scientific community to take advantage of the Fourth Industrial Revolution and develop technologies that will make India a global hub for manufacturing, knowledge and technology based industries. Talking about the need to think beyond silos, PM said that scientists and researchers should have an inter-disciplinary approach. Such an approach will help in finding faster and better solutions for the various scientific questions, PM said.Speaking at the award ceremony Union Science & Technology Minister, Dr. Harsh Vardhan said that today it is because of the efforts of our scientific community that out of 1207 institutions of the world, CSIR has achieved ninth place in the international ranking. He also mentioned about the various Government initiatives to foster innovation and strengthen the Science and Technology space in India.The Shanti Swarup Bhatnagar(SSB) Prize for Science and Technology was instituted in the year 1957,in the memory of late Dr (Sir) Shanti Swarup Bhatnagar, the founder director of the Council of Scientific and Industrial Research(CSIR). Any citizen of India engaged in research in any field of science and technology up to the age of 45 years is eligible to be nominated.